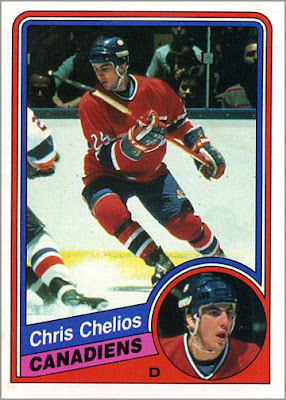 The set consists of 25 player cards, which is a nice number for a 25th anniversary team set. Naturally, all of the franchise leaders are here, such as Steve Maltais and Wendell Young. 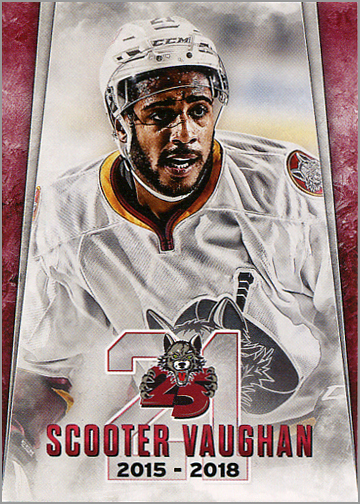 Fan favorites like Scooter Vaughan and Chris Chelios, who finished his Hall of Fame playing career with the Wolves, are included. The set is a who’s who of the team’s best players, as you would expect. 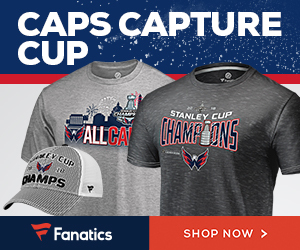 The only reason I don’t give a full 5/5 for player selection is because there are two notable omissions: goaltender Jake Allen and former head coach John Anderson. 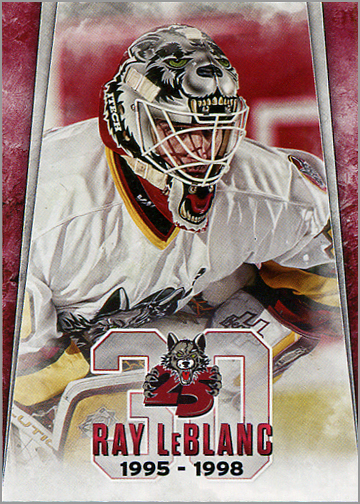 Allen had a monster season for the Wolves in 2013-14, leading all AHL goalies in every statistical category and winning top goalie honors. 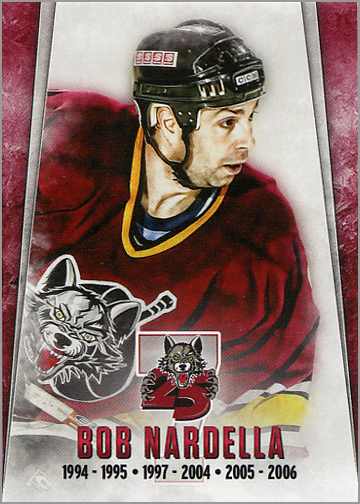 Then again, he only spent one season with the Wolves — but it was a hell of a season. Anderson was the Wolves coach for 14 seasons, including the four that the team won league championships, but I could understand that the set is supposed to focus on the team’s best all-time players. Still, being a Wolves fan literally since day one, including those two would have put this anniversary card set over the top. 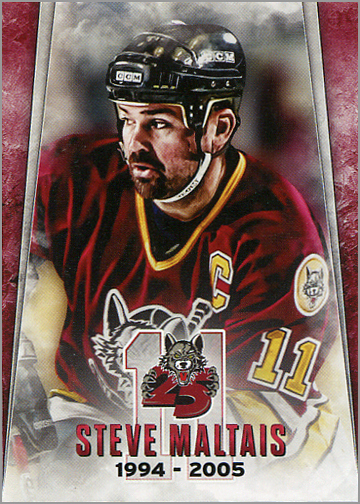 Card fronts used a stylized photo of each player, who is pictured in either a white or maroon Wolves jersey. This gives the cards a nice consistency, as players are not shown in “one-off” jerseys, such as the ones the teams wear on St. Patrick’s Day or other special events. 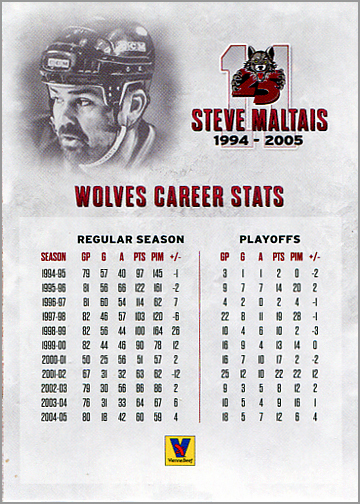 Under the player’s picture is his uniform number, name, and the seasons he played on the Wolves. The Wolves 25th anniversary logo is in front of the player’s number, obscuring it slightly, and making single-digit numbers a bit hard to read. Not the end of the world, though. 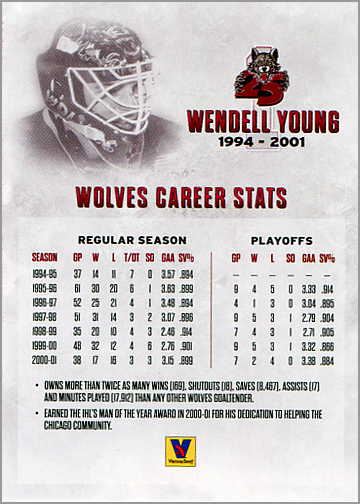 The card backs display the player’s career stats with the Wolves, and give some facts and details about their career if space allows. At the bottom is a Vienna Beef logo. 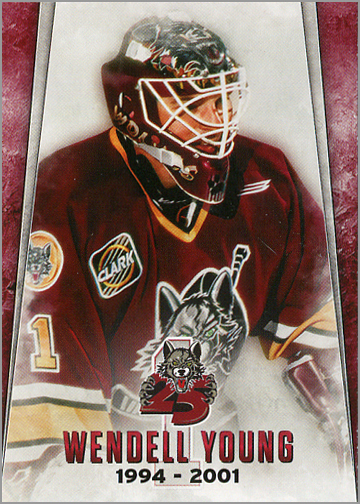 Vienna Beef usually sponsors the Wolves’ team sets each year, and the company’s logo is always small and unobtrusive. My only complaint is that the text is really small, BOLD ALL CAPITAL LETTER TEXT that is hard to read. 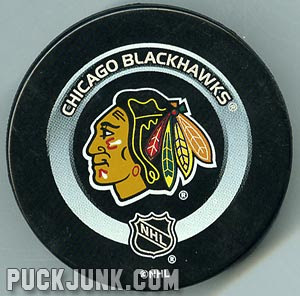 Cards were given away to the first 2,500 fans who attended the Wolves game against the Rockford IceHogs on January 19, 2019. The cards came in a team set bag. The cards are unnumbered, but were put in order of the player’s uniform number, then by last name if two players wore that same number. 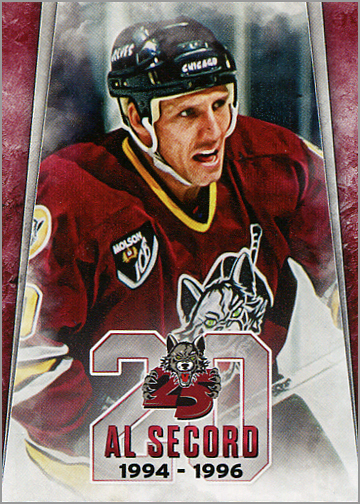 Obviously, if you are not a Chicago Wolves fan, you won’t lose any sleep if you don’t own this set. 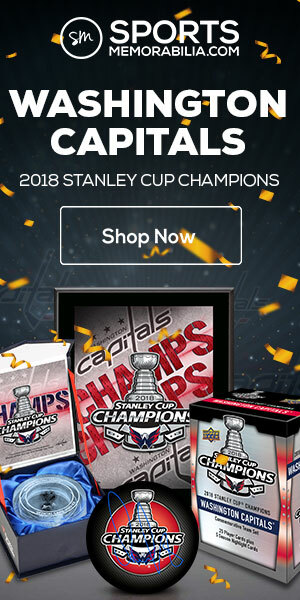 But if you are a Wolves fan, you need to get this set. The cards look great, and all of the team’s best and/or favorite players are here. 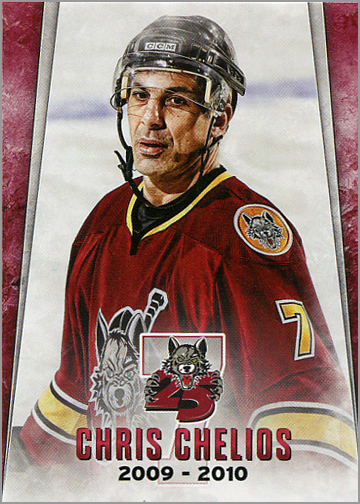 Five Chicago Wolves who also played for the Chicago Blackhawks. Al Secord – Secord played his entire NHL career without a helmet. He retired in 1990 to get his commercial pilot’s license, and wore a helmet when he came out of retirement to play with the Wolves. 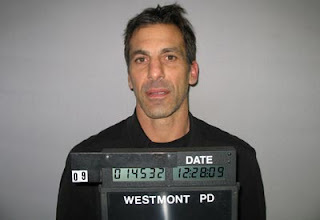 Chris Chelios – One of the greatest Chicago Blackhawks ever, Chelios finished his 28-year(!) 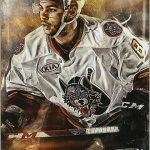 pro hockey career with the Wolves. 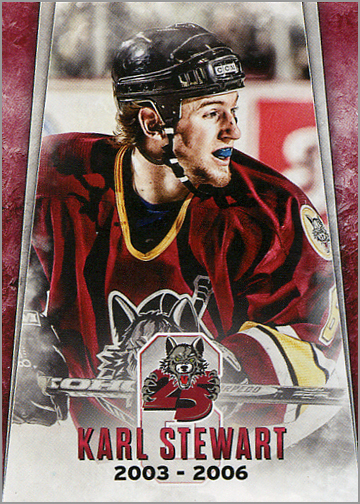 Karl Stewart – After three seasons with the Wolves, Stewart played 37 games for the Blackhawks in 2006-07. 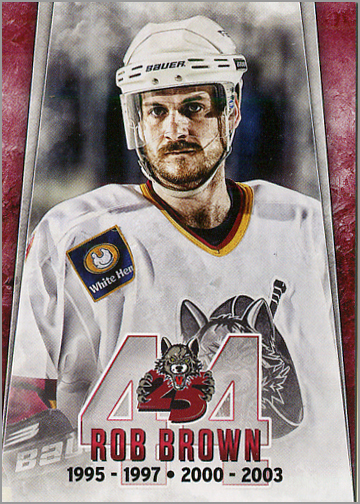 Rob Brown – Brown played 40 games for the Blackhawks in the early 1990s. Who manufactured these? Looks like an ITG design. I don’t know who printed the cards; they are printed on rather thin stock, though that does not change my opinion of a free giveaway set. 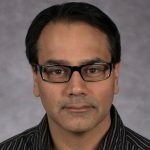 I know the design is done in-house and usually follows the team’s design theme for the season. Excellent review Sal! I do agree with the single digits on the front that you mentioned, it was one of the first things I noticed right off the bat. Overall I think it’s a great set and really highlights the team’s best “25 after 25” if you will. It was a pleasure to meet you and your girlfriend during the game, I really enjoyed our conversation. That Rafales jersey was a pretty good icebreaker if I do say so myself. Hope to see you again around Allstate soon, until then all the best, and go Wolves!! 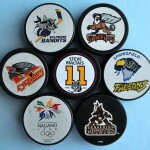 Jamie, it was great meeting you too, and geeking out over obscure minor league hockey teams. Thank you for reading!